Omega 8006 Review: To Buy or Not to Buy? 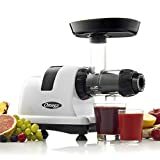 Being #1 in any category on Amazon is a big deal and this is why when we found out that the Omega J8006 Nutrition Center Juicer is ranked #1 under Masticating Juicers, it really got our attention. Why is it the top choice for those looking for masticating juicers? What features does it have that others lack? If you’re thinking of buying this juicer, then we’re quite sure you also want to know the answers. A few minutes reading this guide will reveal all the information you need. 1 What’s So Interesting About The Omega 8006 Juicer? 2 How to Use the Omega J8006 Juicer? 3 How to Clean the Omega J8006? 4 What Do Reviews of the Omega 8006 Say? 5 How Does The Omega 8006 Compare? 6 Where Can I Get Omega 8006 Replacement Parts? 7 What’s the Best Price For the Omega 8006 and Where Can I Buy It? 8 Verdict: Is This Juicer For You? What’s So Interesting About The Omega 8006 Juicer? The Omega 8006, also referred to as the J8006 Nutrition Center is a low speed juicer which processes at a rate of 80 rpm. High speed juicers can run as fast as 1000 rpm which is not always a good thing. You see, if it runs at high speeds, healthy enzymes and nutrients can get destroyed in the process. Oxidation can also take place, which means the juice will go bad quickly. With a masticating style juicer like the Omega 8006, you get the maximum amount of juice from your leafy greens, veggies, fruits and wheatgrass. Aside from being a juicer, this appliance can also be used to make nut butters, baby food, grind coffee and even mince herbs. It’s very quiet. Some say it’s as silent as a ninja. If you prefer to prepare your juice in the morning, using the Omega 8006 won’t be a problem. It doesn’t produce foam in the juice. Juice foam is icky and we always try to avoid it. Fortunately, with this juicer, you don’t have to deal with foam at all. It’s very economical and efficient. This juicer uses a two-stage processing system which means you’ll get more juice from the same size or volume of produce compared to a centrifugal juicer. This machine does not only crush the ingredients – it also squeezes them to get a higher yield of juice. It’s multi-purpose. As mentioned earlier, it’s not just a juicer. It can also make nut butters, baby food, ground coffee and spices, and minced herbs and garlic. You’ll also appreciate the fact that it comes with a 15-year warranty. While some juicers only have 1 year warranties, you’ll never have to worry if yours breaks down even after several years of use. This extended warranty is also proof that the product is very durable and tough. Watch the quick video below to see the Omega 8006 in action! How to Use the Omega J8006 Juicer? This cold press juicer is very easy to use. It works slow and steady. You’ll first need to prepare your ingredients before you switch it on. The ON switch is located at the back, along with the OFF and Reverse switches. Chop your veggies and greens into 1 to 2 inch sizes, and cut your hard veggies and fruits into quarters. Apples, carrots and other hard ingredients can be cut into 6s and 8s. Feed the food inside the feeder (but don’t push it). After a few moments it will come out into the plastic cup while the pulp goes into a separate cup. Depending on the quantity of ingredients you will use, juicing should take no more than a few minutes. How to Clean the Omega J8006? Cleanup is easy. First, you need to make sure the juicer is turned off and un-plugged. Then take the head off, and dis-assemble all its pieces. Use soap and water to rinse them (there are 4 of them) and then wipe clean the metal screen. You can also put them in the dishwasher, except for the filter. Cleanup should take no more than 5 minutes. What Do Reviews of the Omega 8006 Say? The Nutrition Center has garnered an average of 4.6 out of 5 stars on Amazon with close to 3,000 reviews as of this writing. What most of the customers liked about this juicer is that it does a great job of crushing and pressing basically any ingredient that can fit into the chute. The juice tastes great too because this machine works on them slowly, retaining the taste of the ingredients. With the right recipes, adults and even kids will enjoy juicing every day. Many of those who purchased this product have also commented that the motor is very reliable. Even with regular use, their juicer has not shown any signs of malfunction. The ease of cleanup is also one of the many things that they like about the J8006, because it takes them only a few minutes to finish. For those who owned a centrifugal juicer before they bought this one, they are especially happy with how easy it is to clean the 8006. Using it multiple times each day is never a hassle. Finally, the monster warranty has impressed many of those who bought this juicer. While most juicers come with a 5 to 10 year warranty, they are nothing compared to the Omega 8006’s 15 year warranty. But it’s not without drawbacks. Some of the common complaints mentioned in the Omega J8006 reviews include the prep time which can take longer due to the small size of the chute. You’ll have to cut large ingredients into much smaller pieces so they can fit in the tube. Others say that the plastic components eventually broke after a few months and the customer service department of Omega hasn’t been very helpful in providing replacements or assistance to them. Lastly, for those who owned centrifugal juicers before they purchased this one, they complained that juicing takes too long. How Does The Omega 8006 Compare? The NC900 is a 6th generation juicer so it’s a newer model. It is also a masticating juicer and employs a dual-stage extraction process working at a speed of 80 RPM. But unlike the J8006, it has 5 adjustable settings. You can make a variety of healthy snacks from it, and not just juices, nut butters and baby food. It has 2 juicing screens and 6 nozzles. You’ll also appreciate the larger feed chute because it means your prep time will be much shorter. It costs around $50 higher than the J8006 though. But if it fits your budget, go for it. The J8007 is a 5th generation juicer. What makes it different from the J8006 is that it’s BPA free and it has steel components (J8006 uses plastic parts/housing for the 1st stage of the juicing process). It may be safe to say that it’s more heavy duty than the J8006. Surprisingly, it costs less than the older model if you buy it on Amazon. If your budget is limited, this is a good option. The J8008 has a commercial grade motor and a beautiful chrome finish. While the J8006 has 4 parts to clean, this one has 6. It also has a larger feed tube. But while the J8006 is made in South Korea, this model is made in China. South Korea is known for superior manufacturing especially for juicer motors. Both come with a 15 year warranty which is the longest in the industry. They also have the same price. It’s important to note that the Omega J8008 has a 4.7 star rating on Amazon (compared to the J8006’s 4.6 rating). If you aren’t worried about where this product was made, the J8008 may be a better option than the J8006. With the NC800, you get a much larger feed chute which means prep time will be shorter. The J8006 has a 1.5 diameter feed chute while the NC800 has an oval chute that measures 2 inches by 1.5 inches. It has 5 adjustable settings and an adjustable end-cap so you can control the pulp quantity in your juice. If you are looking for a juicer with a large/wide chute, you’re better off with the NC800. It does cost higher than the J8006 though but the price difference is not really that significant. The Omega VRT350 is another popular juicer from the same brand. But unlike the 8006 which has a horizontal design, the VRT350 HD has a vertical design. Both are masticating juicers that have a speed of 80 RPM. We think the VRT350HD is more suited for juicing wheatgrass and soft fruits, while the 8006 is best for leafy greens and hard veggies and fruits (that you need to slice into smaller pieces). It’s also not capable of making nut butters, baby foods and mincing herbs which the J8006 can do effortlessly. The juice quality with the VRT350 is great though. If you’re only interested in juicing and you don’t mind paying more, pick the VRT350. These are both dual masticating juicers that share the same features and functions. The J8004 has a white housing while the J8006 is silver/chrome. If the J8006 is way over your budget, get the J8004 which is cheaper. The Omega J8005 is a single gear masticating juicer in chrome and black. It’s an older model in the Omega 8000 series. Just like the J8006 it can also function as a grinder, food processor and homogenizer. It costs much cheaper than the J8006 (the price difference is close to $100) but it’s been noted that the auger of the J8006 is much more durable and is able to control the machine action better. You can also expect it to last much longer, although this isn’t really guaranteed. Again, your choice could very well depend on your budget. The two major differences between these two juicers is that the Breville JE98XL is a centrifugal juicer and it costs half the price of the J8006 from Omega. Many people agree that the masticating juicer is far superior to the centrifugal type because of the quality of the juice and the nutrients it is able to retain. However, if you don’t have the patience to cut and slice ingredients, or to wait for the juicer to finish crushing and pressing them, then a centrifugal juicer like the JE98XL may be more ideal. The Breville 800JEXL is another centrifugal juicer and it has the same price as the Omega J8006. Choosing between the two really depends on what you want out of your juicer. If you are looking for a masticator, go with the Omega J8006. If you want a high speed juicer, get the Breville 800JEXL. The Breville BJS600XL is a masticating slow juicer. It is about the same price as the J8006 although it is slightly larger and heavier. Additionally, it’s not multi-functional – it’s function is only to juice. Many customers prefer the Omega J8006 over the BJS600XL from Breville because of the differences in their features. The 1-year limited warranty for the Breville juicer is also a downer. The Super Angel 5500 is an all stainless steel juicer with twin gears. It’s also a masticating juicer and has been known to provide superior quality juice. It also looks really nice. You get more juice from everything you put inside it too and just like the Omega J8006 it can make nut butters and soy milk, among other things. However, the Super Angel 5500 costs over a thousand dollars. It’s a lot of money. But if money is not a problem, you definitely can’t go wrong with this one. Where Can I Get Omega 8006 Replacement Parts? The best place to buy Omega 8006 parts is on the manufacturer’s website. You can also check out eBay and Amazon which may carry some parts and accessories for this juicer model. If you are interested in buying it on Amazon, keep in mind they change prices quite regularly, therefore just make sure you check on any given day. What’s the Best Price For the Omega 8006 and Where Can I Buy It? On the manufacturer’s website, you can buy this juicer for $299.99. But you can get a much better price for it if you purchase it on Amazon which offers free shipping as well. Being the #1 best selling masticating juicer on Amazon, it would be easy to conclude that this product is a good buy. However, it really depends on your reasons for buying a juicer. If you want a masticating slow juicer, this one seems to meet most of the requirements – it’s easy to clean, easy to assemble, makes great tasting juices and it has a very long warranty. On the other hand, if you can’t be bothered with long prep times and waiting for several minutes for your juice to be ready – then what you need is a centrifugal juicer like the Breville JE98XL which also happens to be the bestseller under this category. Another option is to get a masticator with a bigger chute like the Omega NC800 or NC900 which may cost a bit more but these juicers do cut down your prep time considerably. Read Next: Omega 8005 Review: Is It Worth your Money?